Soundtrap lets users finish work on a project and pick it up later on a different device. 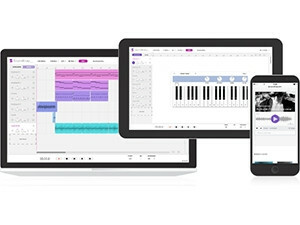 Soundtrap, a freemium music sequencer, digital audio workstation and music-sharing Web site, officially launches today. Operating through the user's browser, Soundtrap can be used on a smartphone, tablet, notebook or desktop and is compatible with a broad range of operating systems, including Android, iOS, Windows, OSX, and Linux. It also works on Chromebooks. Designed for mobility and collaboration, Soundtrap audio projects are stored in the cloud, so the user can finish work on a project and pick it up again later from a different device. Users can also invite others to collaborate on a project, regardless of their location or device. The platform is also designed for easy use by amateurs. "Most traditional systems for music-making are way too complex, which excludes the ordinary musician or singer-songwriter," says Per Emanuelsson, Soundtrap CEO. He explains that Soundtrap aims to eliminate the barrier to entry created by complex recording equipment and technical skills, as well as the barriers to collaboration posed by device- or operating system-specific recording platforms. Soundtrap users "are not tied to a specific machine or venue to be creative", he says. Soundtrap was released as a "very rough minimal viable product" late in 2013, recalls Emanuelsson. It gathered steam rapidly in 2015, growing from 20 000 to 120 000 users in five months, he continues. Along with collaboration, the platform enables new forms of fan engagement for established artists, says Emanuelsson, telling of how Swedish pop group Ace of Base used Soundtrap to challenge fans to a remix competition, offering the winner a 50% revenue split on the winning remix. Currently, Soundtrap is also being used in 300 schools - 150 of which are in the US - including New York University. In addition to not tying schools or students into buying particular devices, the service's device-fluid collaboration features allow students to work together on music, spoken word or podcast assignments in more practical ways, and allow teachers to more easily listen in and provide feedback, explains Emanuelsson. Learners can also engage in inter-school or international sound-based projects, he adds. Soundtrap can also enable remote rehearsal for school music groups, says Emanuelsson. "Record the parts of the choir in a Soundtrap project and invite all the choir members, who can now practice their parts and sing along with the real-world experience of hearing all the parts from wherever they are," he explains. "We see that Soundtrap can be used in many more situations, but right now we are focusing on the consumer and the education markets," Emanuelsson concludes.